Your workers compensation claim must be made quickly and according to injury-specific guidelines. You must supply your employer with written claim of an on-the-job injury within a certain time limit, per Kansas law. Compensation will vary depending upon your specific injury and circumstances. Our emphasis is helping you understand your rights and getting you the most compensation for your injury under the KWCA. Slape & Howard believes workers hurt on the job deserve compensation. Set up a consultation to learn how we can help you. Suffering an injury on the job could have long-term financial setbacks for you and your family. Employers and insurance corporations don't always want to pay up when a Kansas employee is hurt, even if it's not the employee's fault. An experienced attorney can help you get the correct medical attention and will provide you with options for compensation. Contact Slape & Howard to set up a consultation with one of our seasoned attorneys. Schedule a free initial consultation and evaluation right away to see if compensation for your injury is warranted under the Kansas Workers Compensation Act. A contingency fee of 25% of the court appointed monetary award will be withheld by our firm if services are provided. If you've been hurt on the job, let a Wichita, KS workers' compensation attorney discuss options with you. 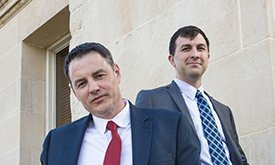 We understand how the State of Kansas and federal government will view your case, and we have options that could help you achieve a better remedy to the suffering you've endured. Set up a consultation with Slape & Howard, and begin your recovery the right way. If you've been injured on the job, you and your family are depending on workers' compensation benefits to keep what you've worked so hard to acquire. The knowledgeable attorneys at Slape & Howard want to help you receive the benefits you rightfully deserve under the law. Get a consultation with one of our attorneys to learn what they can do for you and your family.